One of the few remaining independent media outlets in Azerbaijan, the 2014 Index on Censorship Guardian Journalism Award-winning newspaper Azadliq has been forced to suspend publication due to an ongoing financial crisis. This comes just a day after the government of Azerbaijan targeted prominent human rights defenders Leyla and Arif Yunus and Rasul Jafarov. Yunus and her husband have been detained for three months as prosecutors build a case around charges that include high treason. Jafarov has been banned from traveling. The paper’s Editor-in-Chief Rahim Haciyev told Contact AZ that without an immediate payment of 20,000 manat (£15,105.39) to its printer, the latest issue would not be produced. 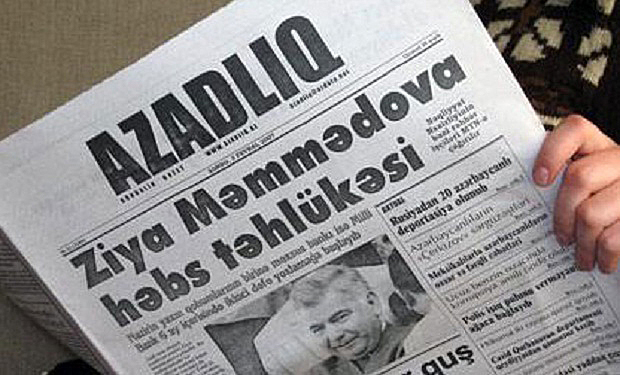 The paper’s government-backed distributor, which according to Haciyev owes Azadliq 70,000 manat (£52,868.86), has refused. This is not the first time that Azadliq, which has reported on government corruption and cronyism, has faced a financial cliff. Read more about Azadliq here. Dictator Aliyev, who suffers from the Xenogiannakopoulou Syndrome, hoodwinks to turn initiatives into reality and declares Azerbaijan’s enormous progress in all fields, not just oil fields! He mumbo-jumboes of the country’s very positive atmosphere and lists the country’s great freedoms: freedom of political activity, freedom of expression, freedom of media. Azerbaijan is proud of these freedoms, he bullshits. The truth about Azerbaijan is quite different from the picture painted by its dictator. In the past two years, Azerbaijani authorities have brought or threatened unfounded criminal charges against thousands of political activists, journalists, bloggers, and human rights defenders, most of whom are behind bars. The Azerbaijani dictator is not alone in his capability for bare-faced falsehood. It’s a specific strain of Soviet and post-Soviet behavior, learned from the Communist Party and the KGB. If the leader says something, it is true, no matter what the evidence to the contrary. There are no political prisoners in Azerbaijan, says Aliyev, and we encourage a free media because it is important to our democracy. There is no point in putting on a play about depression in Belarus, an Alexander Lukashenko apparatchik tells the Belarus Free Theater, because there is no such thing as depression in Belarus! There is justice in Greece declare premier Samaras, Athanasiou of Minitrue, and Kikilias of Miniluv! Political lies in functioning democracies tend to have to do with cover ups of personal or institutional failings. In an authoritarian society, with power utterly concentrated to the leader and his cadre, there is no such thing as an isolated failure. As a result, every aspect of life must be spun. All triumphs belong to the leader, all criticisms are propaganda, all failures sabotage. When there is no balance of power, is there really an objective truth? When, for example, the dictator Lukashenko told a journalist that journalist Irina Khalip, under house arrest, could leave Belarus any time she wanted, was that actually true? Was it true the moment he said it? Did it become true after he said it? And did it remain true? This state of things raises a question for those of us seeking to better the lot of people living under regimes such as Belarus, Azerbaijan, and Greece: can we pounce on the moments when autocrats declare as fact something we know to be untrue, cling on until they actually make it true? Or does this merely confirm the idea that truth is whatever their whim makes it? Leyla and Arzu Aliyeva, daughters of Aliyev, own most Azerbaijani telecoms. They own Azerfon, the country’s third-biggest company. Secret documents prove the daughters also own Azercell, Azerbaijan’s largest mobile phone business. That means the top three companies are owned by the Aliyev family. The family owns most of the mobile market, a commercial dominance that raises serious questions about Internet surveillance and communications security within Azerbaijan. It may also help to explain complaints about costly service. Sona Veliyeva is a busy woman. She manages a Kaspi newspaper, is a member of the National TV Radio Council, and owns and manages several companies dealing with education and university preparation courses. She also happens to be the wife of Ali Hasanov, the head of the social-political department of the Azerbaijani Presidential Administration, who is one of the key figures defining the government’s policies regarding media, freedom of speech and political liberties. She and her family have benefited from regulating many of the businesses they own. It has created a number of conflicts of interest that have not been dealt with by the Azerbaijani government. Another busy member of the Hasanov family is their son, Shamkhal Hasanli. Among other businesses, Hasanli is director of the Araz Radio and produces soap operas. His Kaspi Global is one of the production companies which benefits from the ban on broadcast of foreign soap operas on Azerbaijani frequencies. The soap operas were banned by the National TV Radio Council (NTRC), on which his mother–Sona Veliyeva—serves. His father, Ali Hasanov, explains that the ban was necessary because the government wants to support local producers. In an interview with local media, Hasanov said: I don’t think TV series produced by our companies will get into other countries’ broadcasts. International, well-established production companies do have this opportunity. This is why our local choice can only be to broadcast on local TV channels. He explained that the government’s support, which came through a special presidential decree came about because the President didn’t want Azerbaijan to lag behind other countries: For this we must have our own series and films reflecting our national soul. The Azerbaijani broadcast arena is the only place where we can develop our national mentality, national films and our culture and (preserve) our population’s national soul. Kaspi Global has produced three TV series, including “The Breath of the Jackal,” which is about the struggles of Azerbaijani women and was financed by the state budget. Hasanli has not responded to a request for an interview. Entertainment is not the only focus for Hasanli’s business, which is thriving thanks to family connections. In April of 2011, the NTRC allocated a frequency to Araz FM, a radio station linked to the Hasanov family. The frequency is 103.3 FM, which was previously held by BBC’s Azerbaijani service, which was banned (apparently for political reasons) in 2009. Hasanov, who supported the BBC frequency ban, said state law bars foreign entities from broadcasting in Azerbaijan. And yet that aspect of the law did not seem to apply when the Hasanovs requested a license for a company that has foreign investors. Araz FM is owned by the company Araz Teleradio, which in turn is incorporated by Golden Prince LLC and an individual named Etiram Karimov. Golden Prince LLC was incorporated in 2008 by Iranian citizen Sirous Ghouchkhani and Azerbaijani Azer Veliyev. Veliyev, reportedly a relative of Sona Veliyeva (Hasanov’s wife and Hasanli’s mother) is her business partner in several entities. In 2010, when Araz FM got its broadcasting license, the issue of foreign ownership never came up, says Rasul Jafarov, who competed with Araz Teleradio for a license. Jafarov was seeking a license for his The Alternative Radio project in 2010, but did not get one. Objective TV, an online TV resource, has also failed to obtain a license. Yet Araz FM was granted a license for six years of broadcasts, according to a Jan. 18, 2011 decision of the NTRC. Jafarov filed a legal complaint against what he calls “political discrimination and nepotism by (the) NTRC.” The case is pending in the European Court of Human Rights. Araz Teleradio is registered at the same address as all other companies related to the Hasanov family. At the opening ceremony for one of the Araz FM studios in Park Bulvar shopping mall, Shamkhal Hasanli was presented as the general director of the radio and cut the ribbons. The only press club big enough to host more than 30 people in Baku is also linked to the Hasanov family. The International Press Center started operations in 2003 at the same address where all the family businesses are registered, 1 Fikret Amirov Street. In 2010, the press club moved to bigger space so it could handle even bigger events, as director Azer Veliyev, Hasanov family’s business partner, said to the APA agency. Since the new press center began operations, two independent press clubs closed down due to financial problems and because landlords refused to extend their leases. Chingiz Sultansoy, the executive director of the Baku Press Club which closed in December 2004, says several months before they stopped operations, he received a phone call from Ali Hasanov, who urged him to deny space to Chechen human rights activists, as the event could spoil relations with Russia. “When I refused, Hasanov threatened saying, ‘Do you want us to close that Press Club?’ That day, our electricity was cut off in the middle of the press conference. Electricity cut-offs were somewhat usual practice during unwanted events,” Sultansoy recalls. The Hasanov family’s education-related business benfitted from another government action – the closure of competing schools linked to the Gulen movement. The Gulen Movement is a trans-national religious, educational and social movement led by Turkish Islamic scholar and preacher Fethullah Gülen. The movement has schools throughout the world, including in the United States, and reportedly controls a large network of alumni, including high-level government employees in countries like Turkey and Azerbaijan. The movement and its leaders once enjoyed good relations with the government of Turkish Prime Minister Recep Erdogan but two years ago the relationship soured. Erdogan began closing down Gulenist schools and businesses. Now the conflict has spilled over into other countries with significant ties to Turkey. The network of Gulenist schools in Azerbaijan had been run by a Turkish businessman, who in March of 2013 joined forces with the State Oil Company (SOCAR) to form the Azerbaijan International Education Center Public Union. But in December of 2013, a huge corruption scandal erupted in Turkey, with Gulenists alleging that Erdogan and his son were involved. Suddenly Gulen became an even dirtier word with the Turkish government, and former supporters began scrambling for cover. Turkish press reported that in his visit to Azerbaijan in April, Erdogan asked the Azerbaijani government to follow his example and shut down the Azerbaijani Gulen network. SOCAR closed the schools in June. This shift in Azerbaijani government policy has led to finger-pointing among competing interests, with rivals eager to seize advantage by painting each other as Gulenists. For example, the Kaspi Education Center’s university preparation courses, which are run by Sona Veliyeva, has several branches throughout the capital city, which had been lagging far behind the Gulen network schools in popularity. Critics on social media predicted that the anti-Gulen movement in Azerbaijan could only boost Kaspi’s popularity. Hasanov appears to have been trying to distance himself from the Gulenists even prior to the Erdogan visit. On March 7, Hasanov spoke at a religious affairs conference in Baku. He stated that some religious movements and missionary organizations are trying to establish themselves in Azerbaijan and to “create an extensive network in order to realize their interests”. But he may not have done enough. After the conference, Farhad Mammadov, a former Hasanov employee called for journalists to try to identify Gulen people in the government. Mammadov, former sector chief of the presidential administration and currently the head of the Strategic Researches Center under the president, urged journalists to look specifically for those in traditional Gulenist business sectors: schools, media, and medical facilities. The list of business fields Mammadov described is quite similar to those, Hasanov’s family business controls. Araz Teleradio MMC – Ali Hasanov’s son, Shamkhal is a director. Registered in the same address where several other companies related to family is registered. 1, Fikret Amirov str. Owned by Golden Prince LLC and Etiram Karimov. Kaspi Global LLC (Production company) – registered in the same address. Shamkhal Hasanli is the legal owner and legal representative. Kaspi TM (esthetic clinic, pharmacy business) – registered in the same address. Etiram Karimov is legal representative. Ownership data is not known. Print House (Mətbuat Evi) – registered in the same address. Shamkhal Hasanli is legal representative. Sona Valiyeva is legal owner. Kaspi EC – same address – Sona Valiyeva is both legal representative and legal owner. Kaspi CO (construction cooperative union) – same address, Azer Veliyev is legal representative, Sona Valiyeva, Shamkhal Hasanli, Azer Valiyev, Maisa Valiyeva, Safiya Hasanova are legal owners. International Press Center – Azer Valiyev is director. It used to be located at 1, Amirov street for several years. Kaspi Print Distribution – registered on the same address. Owner is not known. Legal representative: Suleyman Salmanov. Kaspi newspaper – Sona Veliyeva is the owner of the newspaper. In addition to Azerbaijani companies there are Turkish business links of Hasanov family. According to Turkish business registry, Hasanov’s son is a 99% owner of the company Kaspi Global Tourism Construction Shipping Import Export Limited. The company also holds a license for construction of high-rise residence buildings in Turkey. Directly or indirectly, I control all the TV stations. We have banned the BBC, Radio Free Europe and Voice of America from FM broadcasting in Azerbaijan since 2009 because they were trying to make trouble. My men have hounded the opposition press so much that there’s little left – just enough for us to be able to tell the outside world that Azerbaijan is a democracy. Still, I couldn’t care less about a democratic façade because if you give democrats an inch, they take a mile. The street protests in the spring of 2011, prompted by the Arab Spring, gave me a scare. I had the leading opposition bloggers arrested but the rumblings continue. It’s a pity because now we are getting ready for a new election, a presidential one in October, so do you imagine I’m going to let people do as they wish? That wouldn’t be worthy of an Aliyev. Maybe they thought I was a softy when I took over from Dad, but the time for softness is long gone. The opposition newspaper Azadlig managed to keep going for years despite arrests, abductions, threats and beatings, but now it’s on the brink of asphyxia. At last! I am always calling for tougher legislation. It is especially easy at the moment – all you have to do is copy the laws being adopted in Russia. I still tolerate the Internet but I’ve told the security services to be on the lookout. At the least sign of trouble, we block all the irksome websites and jail everyone. Anyway, our coffers are overflowing with so many petrodollars we no longer need to bother with even a pretense of democracy. Silence is like praise, it can be bought. Our generosity has won over many formerly fierce critics at home and abroad. Last January, the Parliamentary Assembly of the Council of Europe tried to pass a resolution “on the human rights situation in Azerbaijan.” We got our way. It was rejected. Obviously. What were they thinking? Business is too important. There was too much at stake for me to let the troublemakers talk. Fortunately, Dad taught me how to make dissidents shut up.